I am very new to Linux and Ubuntu and I have some questions regarding the right way to go about dual booting. I have a Lenovo ThinkPad E570 with an i5, 250GB SSD (which has Windows 10 pro on it), a 1TB HDD, both encrypted using BitLocker while running Windows 10. I've started a Computer information systems degree, in which there's a Linux module. I'd like to keep using Windows 10, and dual boot Ubuntu, while keeping all drives (and partitions I end up with) encrypted. Should I stick with 16.04.3 or is it generally better to keep with the latest version (17.04)? Is it recommended that I partition the SSD and dual boot Ubuntu from the partition on it or should I keep it off the SSD (as it's only 250GB) and run it from the HDD? And if I do partition the SSD / HDD what size should I make the partition? If I have a partition on the SSD for the OS should I also have a partition on the HDD for storage? And how do I go about keeping the encryption with all this? If i partition a drive that is encrypted, will this make an unencrypted partition that I'll be able to encrypt within Ubuntu? As you can tell I'm really confused as to what the best course of action is. BitLocker is Windows/NTFS only, so you cannot encrypt an Ubuntu installation with it. If Linux is not your primary OS, and you are new to it, I would recommend taking the easier approach by installing it as a VM with VirtualBox installed in Windows. This enables you to use both Linux and Windows simultaneously, and not worry about encrypting (it's all BitLocker). There is no risk of making your machine unbootable, accidentally deleting data, etc., as well. I highly recommend this if you have never installed Linux before. There are countless tutorials for this if you search. Another option, which I have not explored myself much, is to use the new Windows Subsystem for Linux. That said, if a VM is not your cup of tea, and you really want an encrypted Linux install dual-boot, I'd keep it simple. Fortunately you have two drives. I'd recommend leaving your SSD with Windows on it alone. You could even unplug it while installing Ubuntu. Install Ubuntu/GRUB to a partition on your 1TB. You can boot the Live USB, go to install, and choose to just encrypt your entire 1TB like in this image. If you can't lose data on your 1TB and want a partition for the install, you have to do the encrypt stuff yourself following a guide like this one or this one. After the install you could choose which drive to boot to in the BIOS. 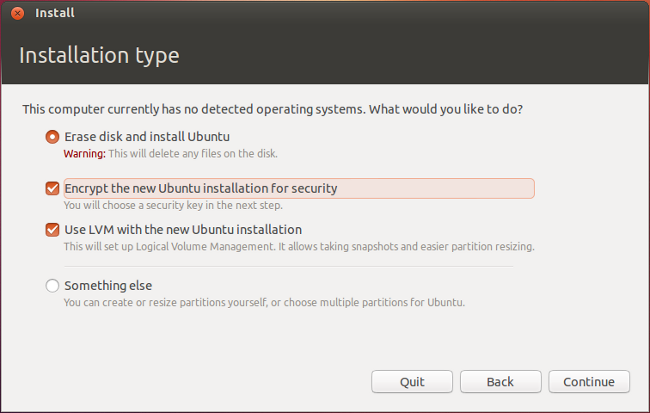 I'd recommend staying with the LTS version of Ubuntu, as it is more supported for everything. That's Ubuntu 16.04.3 at the moment. Not the answer you're looking for? Browse other questions tagged dual-boot partitioning encryption laptop ssd or ask your own question.